A double chin is caused by excess fat and loose skin on the neck beneath the chin which causes the appearance of a second area of fullness beneath the chin called a double chin. Laser liposuction. Laser liposuction is a newer way to remove the double chin. Because the laser fiber is small and liquefies the neck fat, very small 2.5 mm tubes can be used to remove the neck fat. 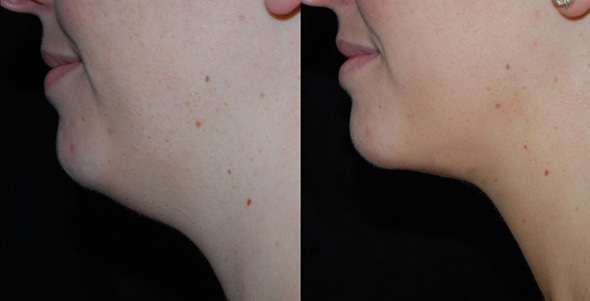 In addition the heat from the laser causes the double chin skin to tighten and contract. This new technology has made removal of the double chin possible without the need for a neck lift in many people. Neck lift with defatting of the neck. Older patients who have a double chin and significant loose or sagging neck skin with visible bands require a neck lift. The fat causing the double chin is removed and sagging neck muscles are tightened. Loose skin is removed from behind the ear. What will I look like after removal of a double chin? There can be significant bruising of the neck after either method to get rid of a double chin. However in some patients there is minimal or no bruising as can be seen in the photo of the patient above in the section on chin implant. You will have a compression garment covering your chin, neck and head for about a week. How long is recovery after removal of a double chin? Expect a 10 day to two week recovery for bruising to go away. Makeup can cover the bruising after the first week. Is removal of a double chin painful? Most patients do not complain of pain but do complain of the tightness and pressure of the facial garment. Pain medications are usually only required the first 2-3 days. What does double chin removal cost? Laser liposuction for double chin costs $7,500. A neck lift with defatting can cost up to $10,000. Who should do my double chin removal? I suggest a plastic surgeon who is certified by the American Board of Plastic Surgery and who is experienced in the techniques for removing a double chin. Dr. Brooke R. Seckel is a renowned plastic surgeon in Boston who performs combination procedures to help patients get rid of a double chin. If you are interested in facial rejuvenation surgery and would like to learn more about chin augmentation, neck lift or mini-facelift, schedule a consultation today by calling 617-455-2859.